In 2010, Markkinointi & Mainonta listed the 100 most valuable brands in Finland. The list is dominated by brands of Fazer and Arla, Fiskars taking the third place, and Joutsenlippu taking the fourth place. But how are these brands doing on YouTube? On 8 May I recorded the number of views each of them had and I compared it to the number of views today. The companies below are sorted according to their brand value as listed by Markkinointi & Mainonta. Fazer had the highest brand value, followed by Fiskars and so on. Companies without a Finnish YouTube channel have been excluded. 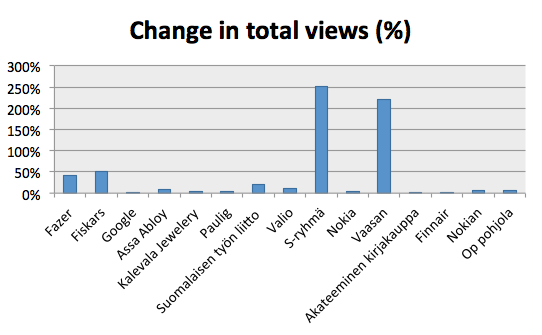 As the graph shows, S-ryhmä and Vaasan have seen the highest viewer growth. Vaasan joined YouTube in April and takes the newcomer prize, having increased their views from 328 to 1052 during the period. S-ryhmä’s channel added 15 new subscribers and went from 7592 to 26679 views. That gives them the title of the fastest growing YouTube channel on the list. Valio takes home the prize for being the most active video producers, having uploaded 26 new videos during the past month. After them comes Nokia with 17 new videos, and Fazer with 12 videos. Is there an awesome Finnish brand channel that should be on this list? Let us know in the comments!